Congressional candidate Richard Ojeda hopes to the course for Democrats in WV. Almost 60 years ago, a brash newcomer to the Democratic Party named John F. Kennedy campaigned across the hilly coalfields of West Virginia and helped shed light on Appalachian people and poverty. His connection to the state helped put him over the top in the 1960 Democratic primary, and eventually helped him win the presidency. "He's the first president that came down here and spoke of West Virginia in a positive light," said Richard Ojeda, a Democratic candidate in West Virginia's competitive 3rd District. "The sun doesn't always shine in West Virginia, but the people do." As a tattooed, retired paratrooper with tours in Iraq and Afghanistan, and currently a state senator, Ojeda was launched into the national spotlight during West Virginia teacher strikes and his campaign for U.S. Congress. Ojeda, who campaigns in his Army fatigues, is unlike the blue-blood Kennedy except that he, too, is a brash political newcomer, and he understands the power of a Democrat showing up and listening. Ojeda's race in the southern portion of the state, a district where Trump won 73 percent of the vote, could pave a pathway for Democrats hoping to run competitive races in Trump country. Ojeda, who voted for Donald Trump in 2016, said he thinks the Democratic party -- the party that once helped put Kennedy over the top -- has lost its way in Appalachia. "It's about finding the people in the areas that can relate to those people and supporting them. It's got to stop being about the most money," Ojeda told ABC News. "You know, you find the person that everyone in that area can relate to, that cares about the people in that area, and then support that person. And if we do that, make no mistake about it, we can go back to blue." 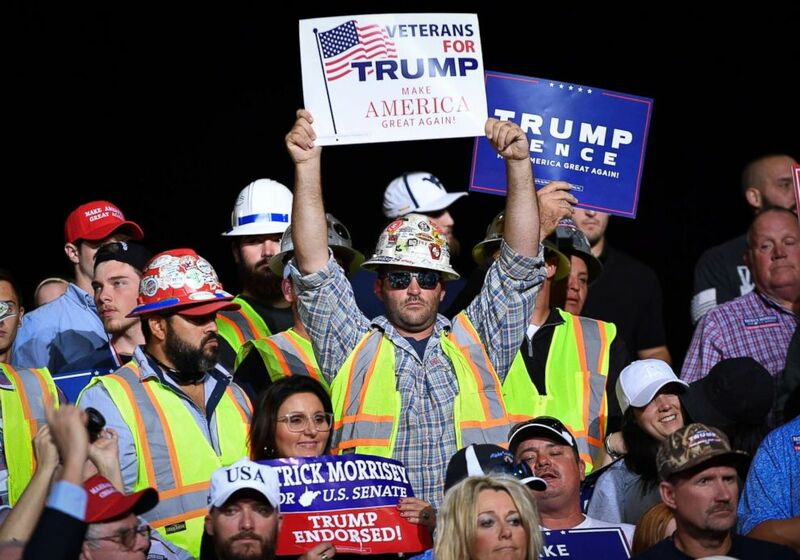 (Mandel Ngan/AFP/Getty Images) Supporters are seen before the start of a rally by President Donald Trump at WesBanco Arena in Wheeling, West Virginia on September 29, 2018. Ojeda and his campaign have been working around the clock to ensure that happens. Wearing Army boots and speaking in an intense voice with a West Virginia twang, Ojeda knocked on doors and made his case in every county of the district. "People canvassing for us are telling us literally out of 30 doors, 21 will say Ojeda, two will say my opponent and the rest will be undecided," Ojeda said. "So I think that we are looking really good. I think we are going to win this." His race against Republican Carol Miller is considered one of the most competitive in the country. Since the primary, Trump has campaigned three times in the state for Miller, and has lashed out at Ojeda as a "total whacko." "I've seen that person -- you can’t have that person in Congress, he's stone-cold crazy," Trump said at a rally in Wheeling, West Virginia. It's a label Ojeda's embraced. "If I'm stone-cold crazy because I have a hard time going to sleep at night because we have kids that go to bed hungry, then I'll be stone-cold crazy, and I'm OK with that," Ojeda said. For Ojeda, it's personal. He said his campaign team is made up of people who have been affected by opioid epidemic. "My political director lost both mother and father to overdose. My financial person, he found his brother dead with a syringe sticking out of his arm and just recently lost a nephew. My media person has spent literally her whole life with her aunt and uncle because of opioids," Ojeda said. In 2016, West Virginia had the highest rate of opioid-related overdose deaths in the country, according to the National Institute on Drug Abuse. "None of us come from areas where wealth is really part of life," Ojeda said. "We come up in these areas, and we've watched people struggle our whole lives. We've struggled. And that's why everyone is so committed to this. I've got people who literally couldn't even tell you how many hours that they've put into this campaign, how many miles they have walked, how many doors they have knocked on, how many phone calls they have made. But they have done it, and they have done it with a smile on their face because they know that we are trying our best to be able to finally shed a positive light and bring positive light back to southern West Virginia." Ojeda is running on a populist, pro-coal, pro-Second Amendment platform that's focused on working families, veterans, fighting the opioid epidemic and protecting social services. He's raised almost twice as much money as his opponent, Miller, who's running on a pro-Trump platform and largely shied away from the media or any public debate. "This is such an important election, to continue the job that our president has done for the past two years, we need to make America great again,” Miller told ABC News. "There are so many different issues, the economy is starting to really roll, and we really need to keep it moving forward. Of course, in southern West Virginia we care a lot about coal, and infrastructure and all those other issues that are important to the entire country." As a Democrat, Ojeda has found a way to appeal to Trump supporters, Democrats, and those who have shied away from politics. He's made a personal brand out of being loud, outspoken, and authtenic. Supporters said he's just more like the kind of West Virginian you know. Just days before the election, as Trump made his final appeal to the state in Huntington, the Ojeda campaign's home base, Democratic Congressman Joe Kennedy III, D-Mass., came out to support Ojeda and tour the downtown. Kennedy, tall, young, and part of the newer generation of the Democratic Party, bounded into Ojeda's campaign headquarters. For the occasion, Ojeda, who's normally dressed in his fatigues, changed into a suit and tie. "Glad to see you here," Ojeda said. "My honor, my honor," Kennedy said with a handshake. Kennedy, the great nephew of John F. Kennedy, has been crisscrossing the country in support of new Democratic candidates. He said he was most excited to come to West Virginia. It's places like this, he says, where the stakes of this election are "crystal clear." "This one is personal. My family has a very deep history here, one that we are proud of, and one that I've heard stories about ever since I was a very little kid," Kennedy said. "You have an opportunity to actually send a message to West Virginia and to our entire country about what politics can be and about what service can be." "I sure wish I could cast that vote," Kennedy said. Ojeda and Kennedy spent time at Jim's Steak and Spaghetti, an old family-owned restaurant in the heart of downtown Huntington. Framed above them was a black-and-white photo of John F. Kennedy, sitting in the same green vinyl benches, being served coffee in 1960. Like many West Virginians, Ojeda said his family remembers when the young political hopeful came to town. "When President Kennedy come to West Virginia, he spoke about West Virginia and the people that gave the people here pride. And my family, my father remembers when President Kennedy was in Logan county and at places like the smokehouse standing on chairs, talking to people," Ojeda said. "I think it's about service and serving the people, and that's exactly what President Kennedy did. And that's exactly what I want to do."